Artist Series Concerts of Sarasota offers a diverse selection of musical experiences to the region, featuring established and emerging classical, cabaret and pops artists. In addition to presenting concerts, another important mission of the organization is to support young aspiring musicians and help develop future audiences. Our artists go to local schools, retirement homes and clubs for outreach programs, which have meaning to people of all ages. Each year we offer 10-15 in-school interactive opportunities for students. 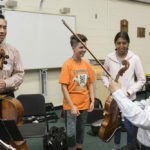 The Ying String Quartet was an inspiration for the students at Pine View in October. In November 2016 singer Todd Murray gave a fabulous Master class for the students at State College of Florida, and his pianist, Alex Rybeck, shared valuable information as well. Also in November, harpist Giuseppina Ciarla performed for students at Booker High School, and the response was electric, particularly as she encouraged the students to touch the strings of the harp. And, young area musicians, Joshua and Andrea Guaita (participants in our scholarship program,) performed for students at the Sarasota Military Academy. 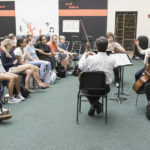 In December, the Elkey Trio performed on their unusual and various instruments , many of which were a “first time sighting” for most of the students at Riverview High School, who were mesmerized and enjoyed the interactive experiences as they made attempts to play the instruments. Over the past five years, our in school programs have touched the lives of more than 12,500 students. We will be presenting a program for Riverview High School students, as well as three community programs in February 2017. A variety of community organizations also welcome our artists and are always thrilled with the music making. In addition to taking our performers to schools, we offer competitions both locally and nationally and have awarded over $300,000. 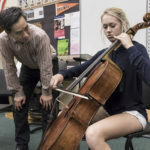 The local scholarship competition is for Sarasota and Manatee County 10th, 11th and 12th grade musicians. The National Scholarship Competition is offered to career-potential performers 18-25 of age. Artist Series Concerts of Sarasota was formed in 1996, by Jerold and Lee Dougherty Ross, and is a 501(c)(3) tax-exempt organization presenting about 50 concerts each season.